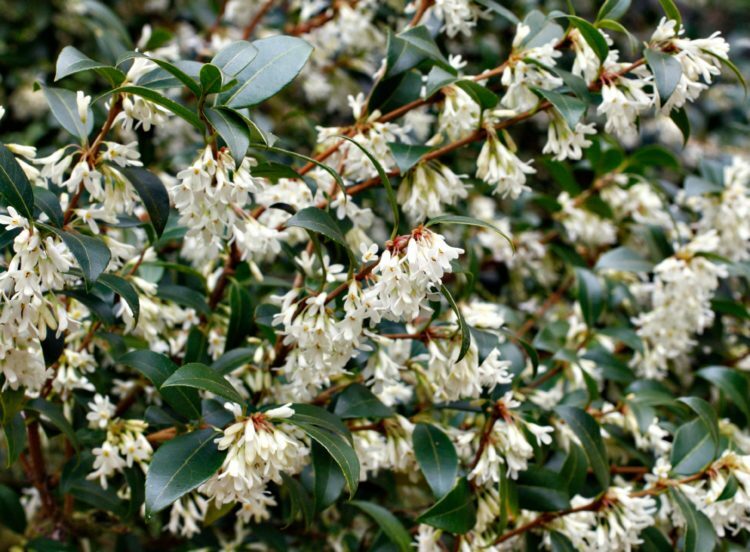 The tiny white flowers of Osmanthus x burkwoodii are sumptuously fragrant making this small leaved evergreen a choice addition to your garden, as a shrub or a hedge. Osmanthus Burkwoodii, part of the Oleaceae family is a large evergreen plant with a slow growing compact habit, suitable to use as a free standing shrub or planted as a hedge. The masses of tiny sumptuously fragrant white flowers are produced in spring providing a rich scent, which at times appears to fill the whole garden. Due to its intense fragrance, it is ideal to plant close to an entrance way, on the patio or along a pathway. The small very fragrant flowers, often said to be scented like jasmine, are set of beautifully against the small dark green and glossy leaves, making it an excellent addition to a garden. It is a very useful plant as it is also extremely well suited to topiary, making focal points in any garden schemes or at entrances. Osmanthus Burkwoodii can reach an ultimate height of approximately 4 metres in time if left. It is suitable for hedges 90-200cm in height, growing at a rate of around 15cm per year and is best pruned after flowering. It will grow in most soils as long as well draining but is not a plant suited to cold exposed sites therefore better planted in a sheltered spot either in full sun or partial shade. Potted in various sizes, these can be bought and planted at any time of year subject to availability. Our office is open to calls for any further questions you may have and we would be happy to help.